Hi loves! How are today? Almost weekend, yay! 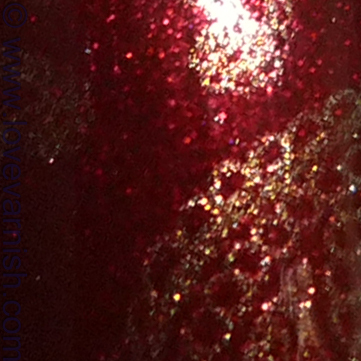 So this manicure was really pretty in real life, but it captured so badly on camera :(. It is actually what I wore on my birthday! This is 2 coats of Chanel Malice, stamped with Chanel Péridot and a Bundle Monster plate. I really love this paisley design and it fitted right in with Christmas (which I when my birthday was). Hope you still like it though the pictures are a bit crappy! Just when I have sworn off my lemming for Malice. You post this. SUper gorgeous! I didn't know Péridot works for stamping, I have to try it sometime. You can't find it love? Had I known before I would have looked for it together with your green beauty! Yes it does, very well actually :)! Thanks! Aww thanks :D! Malice really is a must have ♥. Simply gorgeous!! I just love this!! I would have never thought of putting these 2 together... It look great! It looks lovely!!! These two make such a great combo! I like it. Very beautiful colors! Lovely! I like how subtle it looks! Haha for your wallet :D? Thank you! I love stamping with Péridot! Thank you my dear ♥. 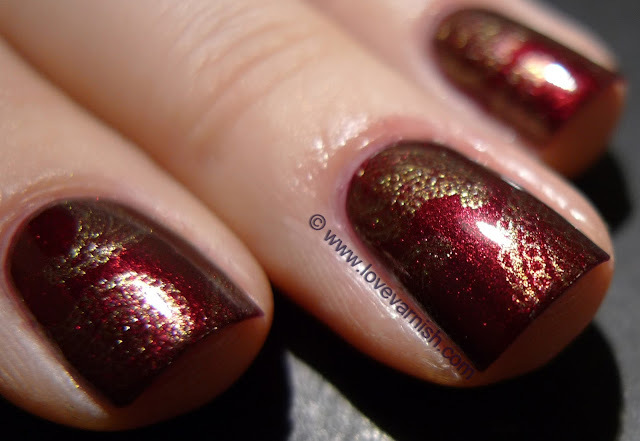 Depending on the angle you had a full on gorgeous stamp or just a hint of golden sparkle. what a spectacular effect. Looks like gold lace over red velvet. very elegant!